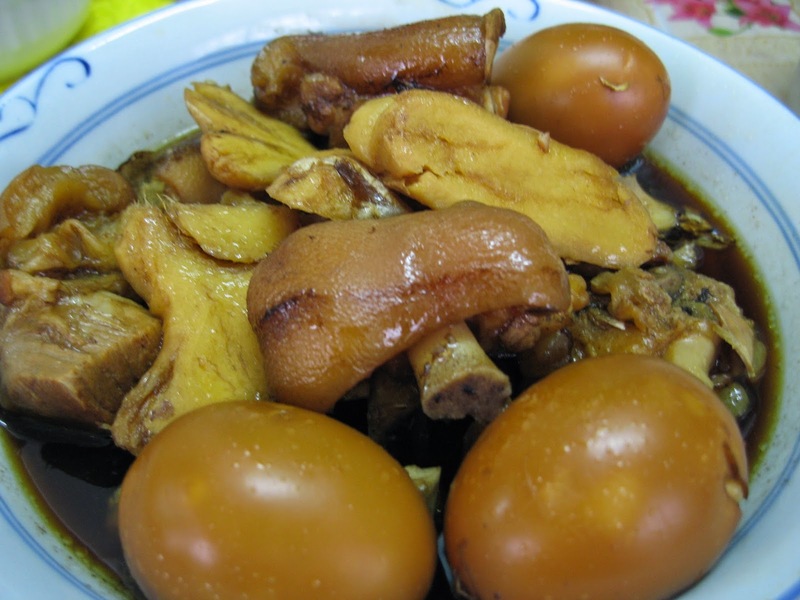 This is a traditional confinement dish which is ever popular and is always featured in cookbooks on confinement food. This is also one of my favourites even when I am not in confinement. I have been craving for this dish ever since I watched Gigi Wong's cooking show on Astro a few months back. It was interesting to watch her cook this dish step-by-step but it would have been even better if she had given the precise weights and measurements for each ingredient used. Anyway I was eager to try out Gigi Wong's way because she cooked it differently from how my late mother used to cook this for me during my confinement. 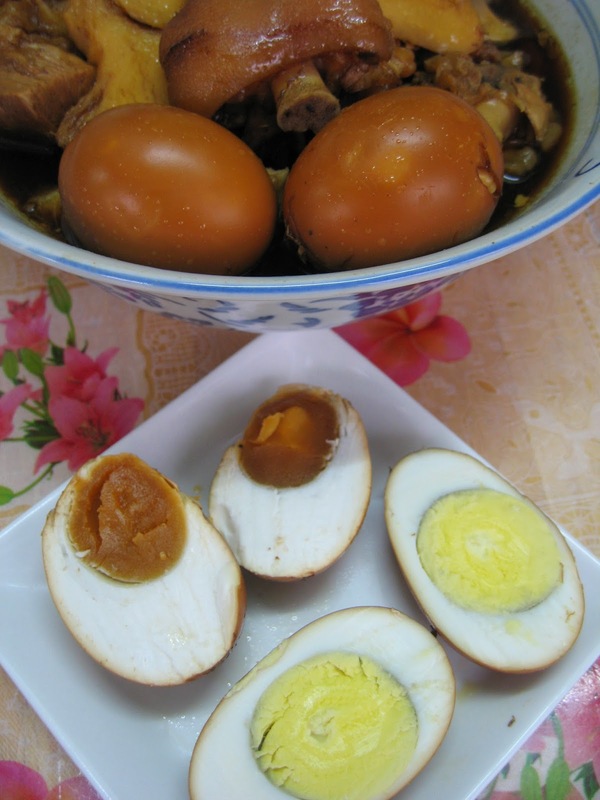 Gigi Wong dipped hard boiled salted duck eggs into the black vinegar in addition to hard boiled chicken eggs. I like the addition of salted eggs! They tasted less salty after being immersed in the black vinegar. Gigi Wong dry-fried the ginger pieces before adding a dash of oil and salt to it. The ginger pieces were crunchy. Very nice, even though the ginger were old and matured. The sweet and sour vinegar soup was so tasty that I drank several bowls after the trotters and eggs were gone! I guess I'll have to go on a strict diet for at least a week or two after consuming so much fat. And I shall have to suffer guilt pangs and worry about cholesterol, clogged arteries and possibly a coronary by-pass! 1) Do not remove the skin from the old ginger. I was told that much of the nutrients and goodness reside there. 2) Use a clean toothbrush to clean and remove the dirt particles from the old ginger. 800g pig trotters , cut into pieces and blanched in boiling water. Drain dry. 1. Dry-fry the ginger pieces in a wok until the ginger pieces are slightly charred around the edges. 2. Add a sprinkle of salt and a dash of sesame oil to the ginger pieces. Remove and set aside. 3. Place water and black vinegar into a pot, preferably an earthen pot, and bring contents to a boil. 4. 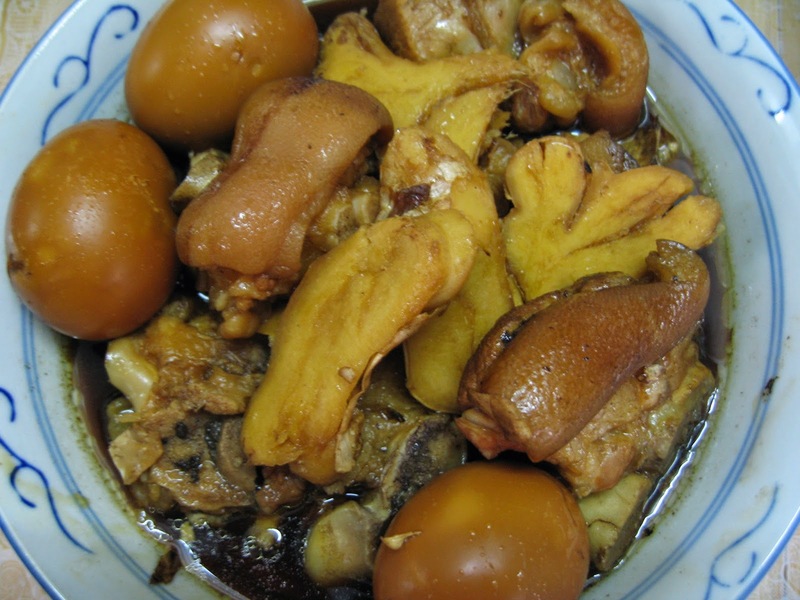 Add fried ginger pieces and cane rock sugar and the hard boiled chicken eggs and salted duck eggs. 5. Continue to boil over slow fire for about 45 minutes. 6. Then add pig trotters and boil until they are tender. About 30 to 45 minutes. 7. Add salt to taste. This looks so delicious! I love the flavours! We actually made this a few mnths ago too. Some interesting, different ideas here such as the salted duck egg, gotta try it next time. Thx for sharing! Many, especially ladies, just love this dish. New Diet Taps into Pioneering Idea to Help Dieters Get Rid Of 12-23 Pounds within Just 21 Days!